Did you know that a thumbnail sketch can help you plan your artwork out before you invest in a ton of time and materials. Thumbnail drawings are easy to draw and super helpful. Let’s learn exactly what these sketches are and how thumbnail drawings can help you right now! A thumbnail sketch is a small drawing that represents the future version of and artist’s artwork. The benefit of a thumbnail sketch is they allow you to visually plan out your artwork. Ideas are merely a starting point. Ideas are meaningless until you put pencil to paper. Your thumbnail sketch will allow you to see your composition, not just visualize it in your mind… there’s a very big difference. 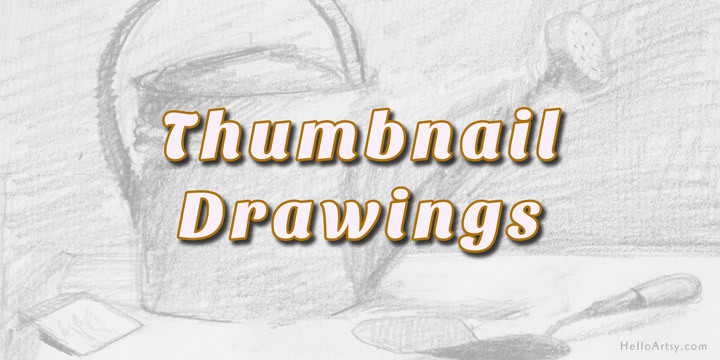 They are called “thumbnail” sketches or drawings because they are meant to be drawn small. How small? It depends really. A thumbnail sketch for a 18 x 24 inch painting may be 3 x 4 inches while a thumbnail sketch for a 10 foot mural may be drawn to 10 inches wide. I cannot count the number of ideas that seemed great in my mind but when I drew them out I realized they were not the strongest ideas at all. Wouldn’t it be great if you could predict the future success your large scale painting? Who wouldn’t like to same time and use less materials making artwork that you regret? This is precisely the reason to complete a thumbnail sketch prior to any major works. 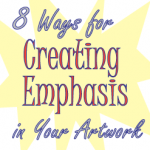 You’ll save so much time and aggravation working out your compositional elements beforehand in your thumbnail drawing! And because thumbnails are quick and small you can explore multiple compositions before getting serious about any single idea. Thumbnail sketches are useful the same way a writer may outline her plot ahead of time or a cinematographer might plan out his story board. Ideas are visually worked out in a low-commitment way long before any work is committed to a larger more lengthy work of art. Every art student should make drawing thumbnail sketches a habit as early as possible. The first thing to remember when you begin to draw your thumbnail sketches is to relax. This is a good time to not tense up worry about things being perfect. Let these small little drawings explore different ideas. In fact, I think it’s a good idea do draw many quick sketches, 5-10 minutes each before going back and working on the strongest designs. What is the size and placement of each element? What is overall dimensions and shape? … Portrait, landscape, or square? How about the negative and positive shapes? Are things going to cropped? Where is your light source coming from? How are your cast shadows adding to the composition? Your sketches can be line only, value only, colored, black and white, whatever is meaningful to you, the artist. It really is about you and what you need to see on paper in order to execute the final, more time-invested work. How you create your thumbnail is a matter of what you need to realize your ideas on paper to the degree that you are comfortable moving forward with a larger, more finalized version. This process of thumbnail sketching first should become part of your art-making process. Keep speed in mind. You should be drawing out your thumbnail sketches with a drawing tool that is both fast and comfortable to work with. This is precisely why most artists choose graphite pencil or charcoal for their tool of choice! Don’t worry about being to precise and forget most details. It’s perfectly fine if your thumbnail drawings look kind of rough! If you decide to add value to your thumbnail sketches you can block-in large areas with a few simple values. Don’t get hung up on shading details and worrying about accuracy. You can, with broad sweeping strokes assign a few values to your thumbnail sketch just to see how the composition could look. You’re investing minutes here, not hours so don’t get carried away with perfect shading! If you do not have a defined size for your larger/major work feel free to create thumbnail sketches in a variety of small sizes and proportions. Because I prepare my own canvases and can make them just about any size I want I often sketch my subject matter with no boundaries. Once I have a pleasing arrangement of subject matter I add my boundaries the my thumbnail drawing last. I then build a canvas that has the same aspect ratio as my thumbnail sketch. I love working this way… it’s very liberating! If you will be completing a major piece of art and you already know its size it would be smart to scale your thumbnail sketch accordingly. There’s plenty of ways to do this, but thinking in terms of fractions works well. 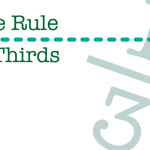 Consider the height of your artwork to be the numerator and width to be the denominator. For example a canvas that’s 18 by 24 inches can be expressed as a fraction would be 18/24. You can now reduce the fraction to find a suitable thumbnail sketch sizes that will properly scale. By reducing 18/24 you immediately get three options: 9/12 , 6/8 , 3/4. Because a thumbnail sketch is meant to small and not take up too much time, I would probably choose to make mine 3 by 4 inches or 6 by 8 inches at the largest. Any bigger and I’m getting too close to the size of the final work. 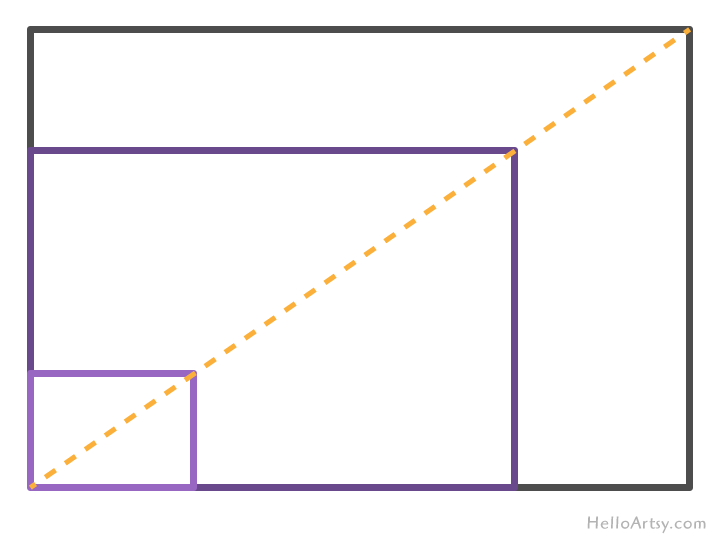 The illustration below shows how all similar rectangles can be connected via their corners with a diagonal line. This geometric principle helps out the artist immensly. You can simply lay a ruler diagonally across your thumbnail drawing to scale it larger. There reverse is also true. You can start with a final size in mind; think 18 x 24 inch canvas. 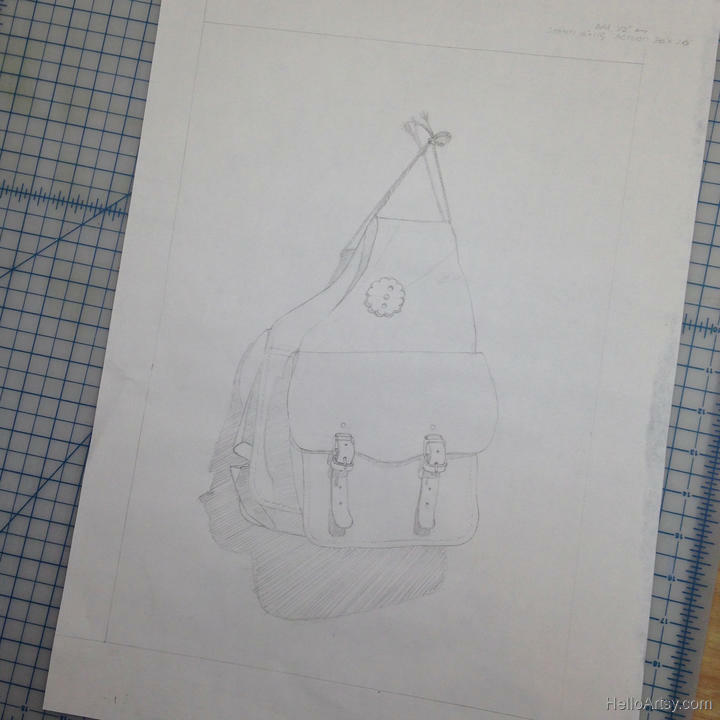 You can then prepare a smaller drawing that is properly scaled. Remember that the whole purpose of a thumbnail sketch is to be able to plan your ideas out visually on paper. Things don’t always go as planned so make sure you keep an open mind. Be okay with altering or abandoning your ideas if they do not seem like good ones once they are drawn out. Treat these sketches as a form of visual note taking. Many artists do actually record written notes alongside of their thumbnails. It’s often a good idea to compare all of your thumbnail sketches and to pick the strongest one(s) and to develop it a wee bit farther once you know it’s a composition worth pursuing! Just don’t waste time shading in a bad thumbnail drawing that’s never going to amount to a major work worthy of your time and attention. Remember to keep your artwork’s boundaries and therefor the aspect ratio in mind before moving on to any larger works. Feel free to adjust the sizes of your thumbnail sketches to suit your needs. A large detailed painting might require a thumbnail sketch that commands a few extra details. You can always draw out a time one emphasizing simple value relationships first. Next you can compose the same drawing slightly bigger and emphasize a semi-accurate rendering of each shape and form. You can also use thumbnail sketches to investigate details. 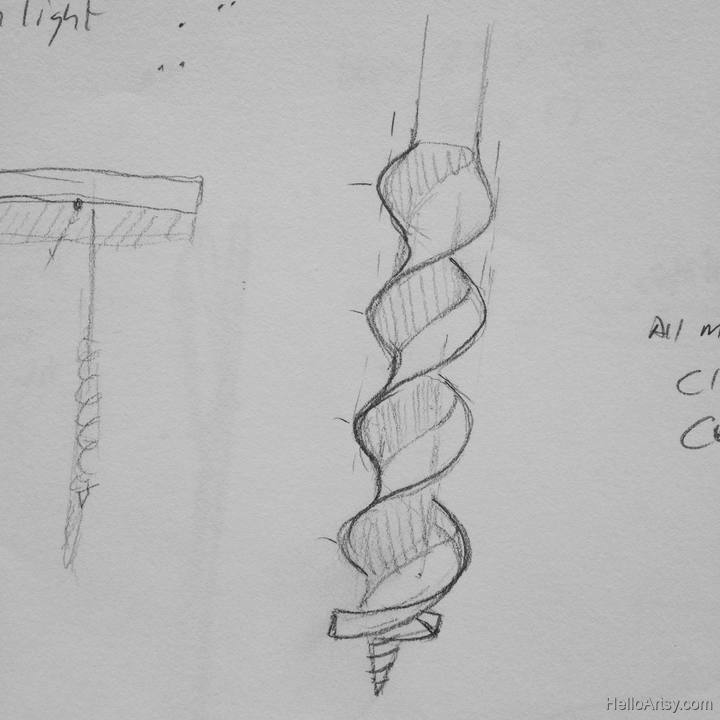 I needed to work out the threads on a larger drawing of a barn auger I was creating. It made sense to sketch out that part in my sketchbook first. Working for a client or with collaborators? Thumbnail sketches represent the perfect common language for sharing ideas. Art, design, graphics, etc. represents some of the hardest ideas to get across with words alone. 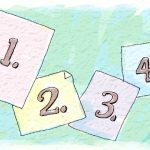 A picture may be worth a thousand words, but a thumbnail sketch will save you endless amounts of time that would have been lost to miscommunication. Fortunately you don’t have to rely on just words. You can quickly sketch out a few small drawings to communicate your vision of any project. Once a client sees your thumbnail sketch they will have a fairly good idea of the direction you were planning on taking the project in. It will then be easy for the client to then build upon your ideas and make suggestions that you can quickly implement. This can all happen in a matter of minutes with just a pencil and a piece of paper! 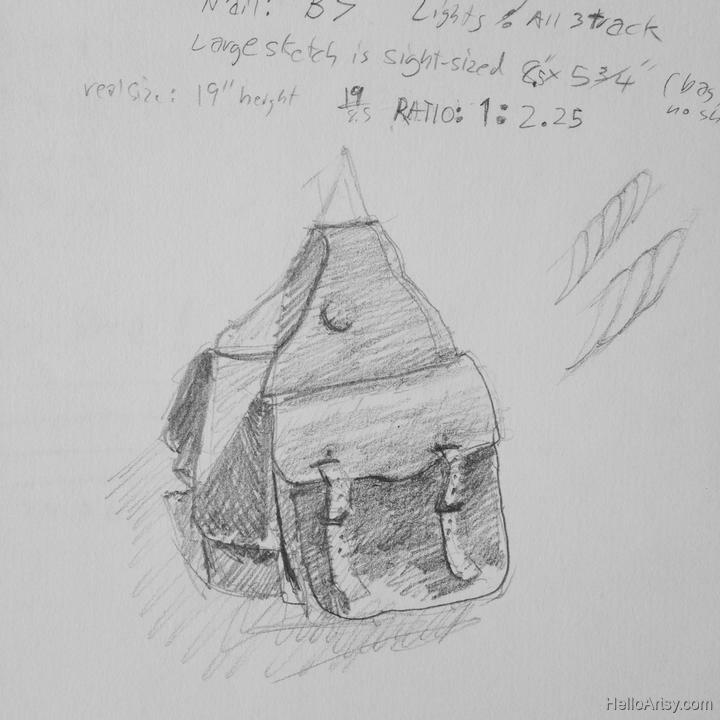 This tiny thumbnail sketch of a saddle bag was used to plan out the composition of a much larger painting. 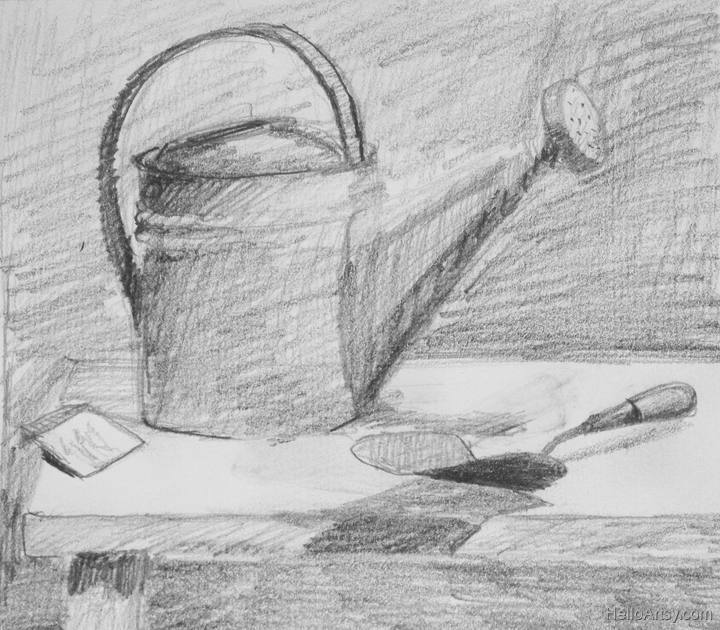 This sketch allowed me to quickly explore the compositional aspects of the subject matter before investing in a much larger work. From here I worked up an even bigger sketch which helped me finalize some of the compositional nuances. And after I was comfortable with my preparatory sketches I was able to complete an oil painting that was planned out ahead of time. 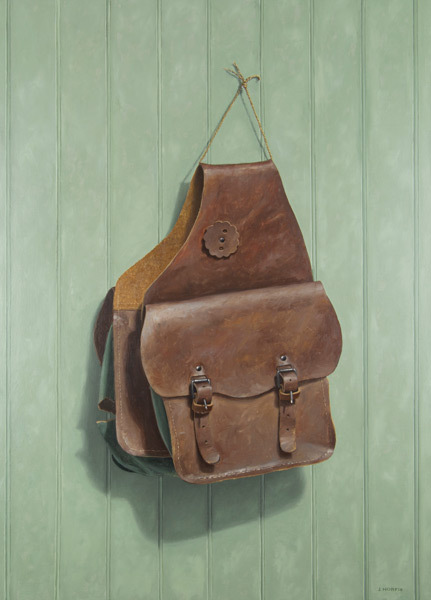 You can read more about the saddle bag painting here. Here’s a few more example of thumbnail drawings at work! 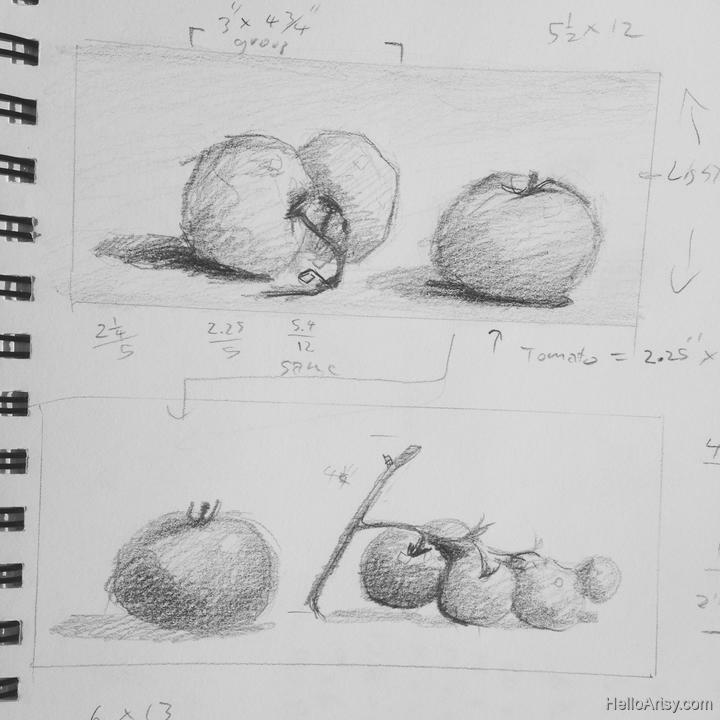 These sketches of tomatoes document different positions and arrangements of the tomatoes. I would have hated to begin a much more serious drawing or painting only to have to keep changing things. Here’s one of the final paintings derived from the thumbnail sketches! And as always you can find out more about this painting too. As you can see thumbnail sketches have their place in any serious body of art. The practice of quickly planning out your artwork on a small scale saves tons of time and materials in the long run. 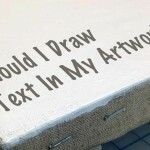 Should I Draw Text In My Artwork? Thanks. I have had real problems with proportions in my work…in other words, I did not start thumbnail…I just began on the (18×24) and then realized proportions were wrong halfway into the work. I need help understanding relationships in distance; seems my brain thinks my featured item should just fit naturally…but it doesn’t come out that way…I will practice thumbnails. The more complicated the composition the more valuable the thumbnail sketches become. They allow you to make all your mistakes small and up front. Thank u .it helps me alot.